The Great Wall of China (Changcheng) is without a doubt, one of the most remarkable man-made structures on Earth. Nestled into the northern Chinese landscape, the wall snakes over mountains and follows the lay of the land from west to east, using the topography to its advantage. In fact, almost one quarter of the ‘wall’ utilises naturally occurring rivers and valleys, negating the need for any stone constructions. Despite holding the title of longest wall in the world, the Great Wall of China is beginning to show its age. Today, just a handful of sections are open to the public as thousands of kilometres have crumbled over time and are unsafe for visitors to traverse. 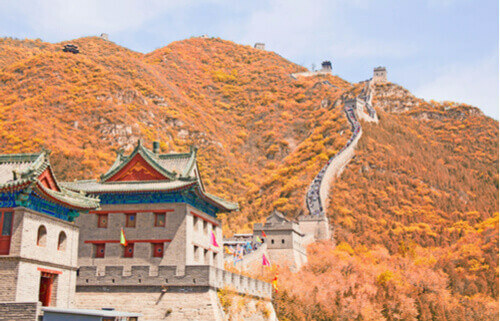 The Chinese government is constantly working to repair parts of the wall and preserve as much of its structural integrity as possible, but some sections — particularly those of the Ming Dynasty — are still in great condition considering their immense age. The wall itself was built with various materials including stone, wood, earth and brick, depending on what was available in the region it was built. Heights are between four to eight metres, while the total length of is estimated at over 21,000 km. The Great Wall of China is unique for many reasons, but perhaps the most profound is the fact that it’s one of the only projects that was continuously worked on by different dynasties over the course of two millennia. 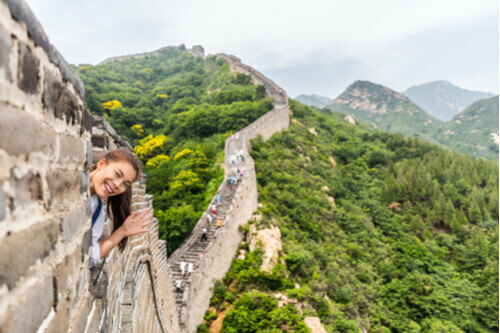 Experts believe that the first sections of the wall were constructed during the Zhou Dynasty, over two thousand years ago, in order to defend themselves against the neighbouring regions they were conflicting with. 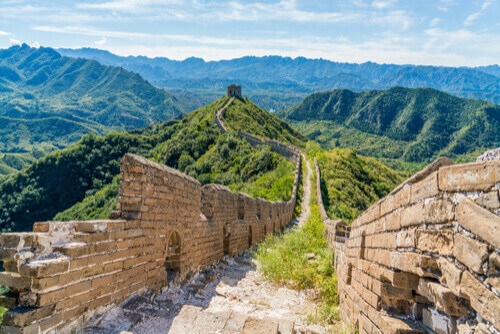 Other sections of the wall were built by various states, but it wasn’t until the reign of Qin Shi Huang that the sections were joined to create one continuous wall. Ultimately, this was done to create a physical barrier against nomads encroaching from Mongolia. It’s estimated that 300,000 soldiers, prisoners and peasants made up the Qin Dynasty workforce, of which tens of thousands perished during construction. Without modern technology, workers were forced to transport materials and build by hand or use archaic tools like ropes and pulley-systems. After the death of Emperor Qin, the Han Dynasty continued to reinforce and rebuild the wall in parts where it had started to disintegrate. He also prioritised a section called the ‘hexi corridor’ in order to protect the Silk Road trade route that connected China with western Asia. Various dynasties continued to maintain and extend the wall for centuries, adding fortresses and other defensive mechanisms. The next significant period of the wall’s history began with the Ming empire in the 14th century. During their reign, Emperors of the Ming Dynasty mobilised labour forces once again to extend the Great Wall by thousands of kilometres and transform existing sections into multi-line walls. 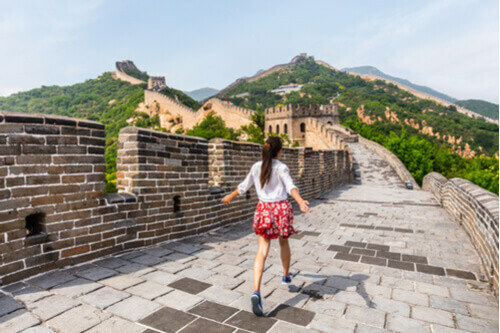 To this day, the Ming section is the best preserved and most extensive part of the wall, hosting a majority of the four million tourists that visit the UNESCO World Heritage Site every year. 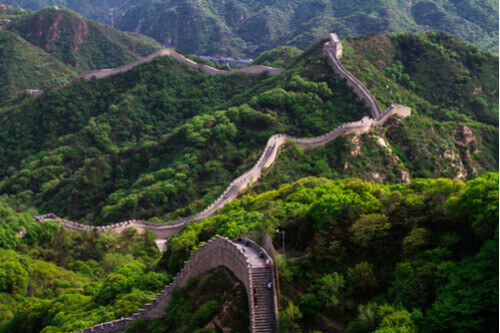 A visit to the Great Wall can be customised to your level of fitness. If you’re a keen hiker, the Jinshanling section offers stunning panoramic views of the surrounding mountains, but requires moderate fitness levels. The Mutianyu section is the most popular and child-friendly, with its relatively intact stone walls and towers. For those seeking accessibility, the Juyongguan section is closest to Beijing and easy to get around. It also boasts one of the most intact forts along the entire wall.